AMAB Book Publishers and the Arts-Muse Fair News Blog are hosting Dr. Ibraheem Dooba to a book reading and chat. 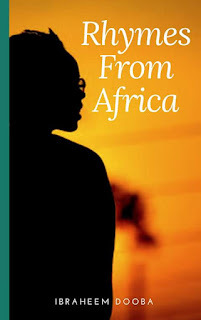 Ibraheem Dooba is the author of Rhymes From Africa, a new poetry collection published last month. Employing rhymes and pictures, poems in the book deal with love, intellection, and societal mores while celebrating African values and the continent’s beautiful flora and fauna. The book reading and signing will hold on Saturday 16 December at AMAB Bookshop, No1. Himma School Road, beside NNPC Mega station, Western by-pass, Minna, Niger state. Copies of the book will be available for sale at the occasion. The chat will be moderated by Abdullahi Ismaila Ahmed of the Dept. of English and Literary studies, ABU Zaria with BM Dzukogi as the Discussant. The event is open to the public. Ibraheem Dooba, Ph.D, is an Educator, Data scientist and newspaper columnist. He is the author of two other books, Muslim Scientist: A conversation with builders of modern Science and Again, Does God Exist? He served briefly, in 2015, as the Chief Press Secretary of the Governor of Niger state.